As someone who's lived in LA for over 11 years (shoutout to San Fernando Valley! ), it is exciting to see how much the vegan food landscape has changed. What used to be something of a taboo is now something that is embraced and appreciated. If I had to describe the vegan cuisine in Los Angeles, I would not only say delicious, but also inventive, forward-thinking, and yet still rooted in the diverse communities that comprise the sprawling city. More than ever, it's an exciting time to be a vegan in the City of Angels. *A little note: While we do regularly visit Los Angeles, and as much as we want to put every single vegan spot there is, we can only cover so many for the time we're there. This is just a reminder that we will be continually updating our LA vegan food eating guide and you should look for more posts about LA vegan food in the future! With that said, keep scrolling below to see which restaurants made our list for our first post in LA! 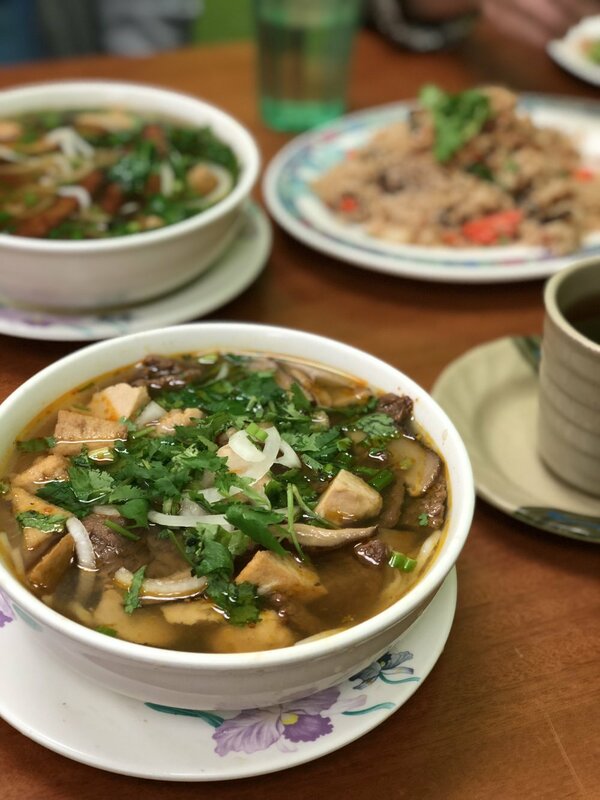 "Authentic Vietnamese café and tofu factory in the heart of Reseda"
I've said it many times and I'm saying it again, if you're in LA, you HAVE TO go to Vinh Loi Tofu. We know it's in the Valley, but believe us, it's worth it. This 100% vegan restaurant is, hands down, one of the best restaurants with the best vegan food we've ever had. The place itself is located in a strip mall, a no frills shop that makes their own tofu in their kitchen and is operated by Kevin Tran, an immigrant from Vietnam who is also a proud father and a hard working triathlete, which inspired some of the names of the dishes. On a regular day, this place can be packed with Angelenos from all over, most of whom are not even vegan themselves. One look at their menu and we wouldn't be surprised if you have trouble deciding. One thing is for sure, we've never had a bad meal at this shop. You should also feel free to ask the staff for any recommendations, as they have always been very friendly to us. In this image, we tried two of their house special pho, some shiitake fried rice and some hot green tea, which was perfect for a rainy day in LA. 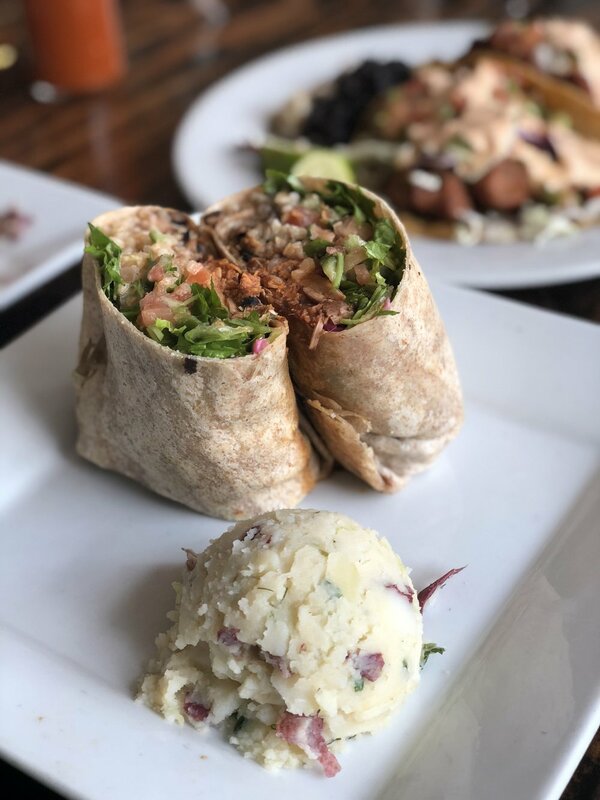 "Fast casual eatery with multiple locations across Southern California"
There are many things that we can say about Veggie Grill but the one that we love most about this place is their mission to bring affordable, delicious vegan food to the masses. Admittedly, looking at this image, Veggie Grill might not look like the healthiest vegan spot, but it's certainly a place where everyone can have a very full and satisfying meal. Veggie Grill's menu is pretty much indicative of what most Angelenos eat, leaning very heavily on the Mexican cuisine influences, like tacos, burritos and nachos. But they also have some Asian-inspired dishes like tempura veggies and lettuce wraps as well as some Middle Eastern flavors like their Fala-full sandwich, which we might have to try next time. If you're looking for a quick and satisfying bite that can please almost every palate, Veggie Grill is definitely a safe bet. "Plant based café with multiple locations in LA"
Sage in Echo Park has been a mainstay in the neighborhood for over a decade (maybe more) and I've had some pleasant memories eating at this place. Their food is all vegan, including the drinks and the KindKreme desserts, and they recently expanded to include an in-house brewery with over 20+ beers on tap. While the food is good and we are elated that their business is thriving to deliver more plant-based meals to LA residents, we are disappointed to learn of the (somewhat) recent revelation regarding their farming practices in their Be Love Farm in Vacaville, California, which prompted several vegans to outright boycott the restaurant and some even sending death threats to the owners. While we don't agree with the practices that the owners choose to do with their farm, the main point of this post was to list the vegan foods available in LA, and we leave it up to our readers to decide whether they want to support this business or not, as well as other businesses affiliated with this establishment. "Hip and trendy Mexican restaurant in WeHo with an outdoor space"
It is not uncommon to see so many well-dressed patrons at Gracias Madre, which has been a restaurant that attracts some of the more affluent residents of West Hollywood. The crowd tends to be more on the pretentious side and the highly-Instagrammable restaurant is known for its beautiful decor, amazing outdoor patio, and of course, its elevated Mexican fare. Crowd aside, the food, in our opinion, does deliver, with flavors that are fresh and well-rounded. We went there for brunch and the drinks, which after the legalization of the recreational use of marijuana passed, have become more inventive, with some cocktails infusing pot, giving a whole new meaning to a drink buzz. The restaurant also offers a prix fixe tasting menu, which we think is worth it, and if you do decide to do it, be sure to get the pumpkin scone. *P.S. This restaurant is also affiliated with the above restaurant, Sage. However, we are not entirely sure if they, too, use Be Love Farm produce. "A favorite among the LA vegan glitterati helmed by celebrity chef Tal Ronen"
When we first heard that longtime vegan Ellen DeGeneres had a favorite vegan restaurant that she and wife Portia deRossi like to frequent, we immediately had to check out this restaurant. We, of course, were not disappointed at Crossroads Kitchen. Aptly named because Mr. Ronen, the chef behind the concept, describes the restaurant as "an intersection where vegans, flexitarians, omnivores and meat eaters can cross paths to share a delicious meal and a good time." Crossroads, which is located in West L.A., is more of a high-end restaurant and the food is as delicious as the atmosphere is inviting. While they usually serve haute vegan cuisine, it was definitely a pleasant surprise that they had a vegan version of the infamous In 'n Out double-double (made with Impossible beef patties) with fries and vegan milkshakes as their brunch special. As a vegan who used to eat In 'n Out, this was impossible for us to resist. "Casual café with deli service in Silverlake using high quality, organic ingredients"
Floré has been one of my go-to restaurants ever since I first became vegan almost 5 years ago in Los Angeles. I've always loved going to Floré for their casual atmosphere and their friendly service. One time, one of the servers felt bad that our food took too long to come out (which it didn't) that he gave us a chocolate cupcake on the house. I've gone here with friends and family before, and it is actually my mom's favorite vegan restaurant to go to. I've even gone on a date here a couple times. Not only is the food at Floré delicious, it's also pretty consistent. I still remember the first time I had their Southwestern Seitan Quesadilla, when I was still only a couple months being a vegan and I remember thinking how hard it was to eat out. And then I had this quesadilla, which is made with cashew cheese, seasoned seitan, tomato, and that unforgettable cilantro cream sauce, and I remember thinking, "You know what, if I can eat and have food like this, I think I can be a vegan." To this day, I still have a special place in my heart for that quesadilla. "Traditional London pub serving Cornish fare in a British pub setting"
I've always wanted to go to London and have been wanting to try traditional English pub food ever since the enigmatic Quarrygirl posted about it. So when my best friend told me that there is a place in Los Angeles that serves traditional vegan London pub food, we immediately had to check it out. And boy, were we impressed. While the Stalking Horse is not completely vegan, they do have an impressive vegan menu, which I dare say rivals even Mohawk Bend. (Come at me! I dare you.) The fact that they specialize in Cornish food is so mindblowing to me that I need to tell everybody about this place. We tried the Welsh Rarebit, which to this day, I'm not really sure what it is but I need to have it again. I also had the vegan Cottage Pie (pictured), which, get ready, comes with carrot, onions, green peas, mashed potatoes, brown gravy, and yes, minced Impossible Burger meat in a cast iron skillet. It was amazing. My mouth is drooling as I'm typing this and I'm already making plans for when I'm going there again. You should be, too. "All vegan and gluten-free ice cream shop in Hollywood"
If you know me at all, you know that I have sweet tooth and it is rare for me to end a meal, let alone dinner, without dessert. So when the person behind the counter said that everything in their shop was vegan, I, of course, had to at least try a sample. I'm a sucker for Butter Pecan and immediately had to get a cup after the tiny sample melted in my mouth. Using a blend of coconut milk, cane sugar, and vanilla as their base, the ice cream flavors in Cocobella are both creamy and creative. Next time, I might just have to try the Strawberry Fields or the Unicorn Magic. "Craft beer and restaurant with a separate vegan menu"
Mohawk Bend in Echo Park has been one of those places that both vegans and non-vegans can go to and somehow peacefully exist with each other. Maybe it's the casual atmosphere, the amazing vegan selection of burgers and pizzas (and buffalo cauliflower!) or just the really strong cocktails, but somehow, through the years, Mohawk Bend has been a neighborhood favorite. Every time I go back to LA, I almost always go to Mohawk Bend. Usually filled with cool East L.A. folks, the vibe in this place is laid back but not pretentious. "Upscale restaurant by Matthew Kenney in the hip neighborhood of Abbot Kinney"
Whether you hate him or you love him, one thing is for sure: Matthew Kenney knows how to make damn good vegan food. Every single restaurant that we've been to has not failed to impress. While the service might fall short sometimes, the atmosphere and the food more than make up for it. Plant Food & Wine in Venice is no exception. The cheese plate alone (pictured) is enough for me to go back. That and maybe the gorgeous back patio. It's always fascinating to me how he chooses to describe the food in his menu. He doesn't describe it with a lot of fancy words like you often see at other upscale places, instead he relies on the ingredients and lets you decide how good it is. In other words, the food is simple in idea but otherworldly in taste and execution. Definitely a place to add to your list to check out in Los Angeles. So that's our first post for Los Angeles. We know we missed a lot and eventually, hopefully, we'll get to cover most if not all of the amazing vegan food in LA. Do you have any places that we absolutely have to go to? Leave us a comment below!